**This is such a wonderful design that we have left it as an option year round. The tulips are easily replaced with another seasonal fav. Mix fresh flowers, tiny forest plants, and a hidden nest; and you have a whisper of whimsy that will endear any who look in on it. Spring spirits abound in a table wreath of tulips, roses, ferns, ivy, mosses, and other organics-no better a garden partnership. 10-12" wreath 135. **For a party consider a larger garden; wreaths are available up to 36"- they are breathtaking. Mix fresh flowers, tiny forest plants, and a hidden nest; and you have a whisper of whimsy that will endear any who look in on it. 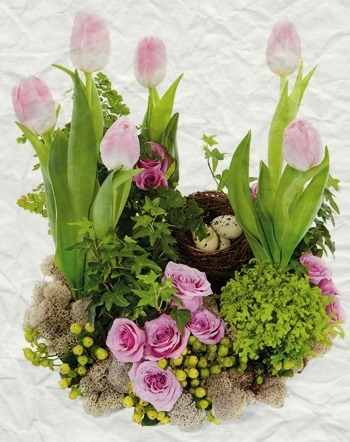 Spring spirits abound in a table wreath of tulips, ferns, ivy, and mosses-no better a garden partnership. Your color choice or ours. 10-12" wreath 135.